SSCC Theatre proudly presents Becky’s New Car, playing in The Edward K. Daniels Auditorium at Southern State Community College, Hillsboro, Ohio, November 6 & 7 at 7:30 p.m. and on November 8 at 3:30 p.m.
Have you ever been tempted to flee your own life? Becky Foster (played by Paula Campagna) is caught in middle age, middle management and in a middling marriage—with no prospects for change on the horizon. Then one night a socially inept and grief-struck millionaire stumbles into the car dealership where Becky works. Becky is offered nothing short of a new life…and the audience is offered a chance to ride shotgun in a way that most plays wouldn’t dare. Becky’s New Car also features the acting talents of: Jacob Bice, Madison Hatfield, Mark Holmes, Bronwyn Jones, Bryan Kessinger, and Bob Lambert. The production team includes: Rainee Angles (director) Rainee Angles and Abraham Martin (production), Laura Martin (costumes) and Benjamin Gullett (public relations). Cindi Anderson is the stage manager and Melissa Griffith is the assistant stage manager. Fulfilling other crew positions are: Brent Angles, Charlotte Brown, Coni Coleman, Heather Cumbo, Katlyn Edenfield, Adomas Fabin, and Callie Fryman. Tickets for Becky’s New Car are on sale now starting at $8 at www.sscctheatre.com. At the door, tickets start at $10. Credit cards are accepted for online purchases and at the door. Seats for this production will be reserved, so it’s recommended that tickets be purchased early. Season tickets for the twelfth season, that also includes The Great Gatsby and Vanya, Sasha, Masha, and Spike, are also on sale now starting at $21. 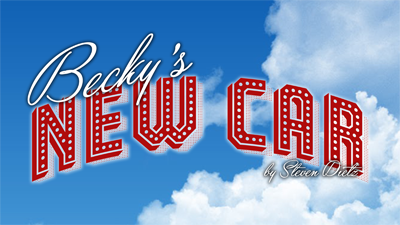 For more information about Becky’s New Car, the twelfth season and more, please visit www.sscctheatre.com.